Barnstormers Individual Game Tickets On Sale NOW! 03/14/2011 9:43 AM - DES MOINES – The Iowa Barnstormers of the Arena Football League announced today that individual game tickets for all 2011 season home games will go on sale Monday, February 28 at 10:00a.m. Tickets can be purchased online at www.iowaeventscenter.com, the Wells Fargo Arena Box Office as well as all Dahl’s Ticket Outlets. Tickets will be available in various price levels for all nine regular season home games, starting as low as $15. 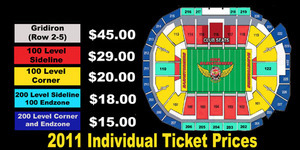 The Barnstormers will host the defending AFL champion Spokane Shock in their 2011 regular season home opener on Friday, March 25th at 7 p.m. A complete 2011 schedule and individual ticket pricing grid can be found below.